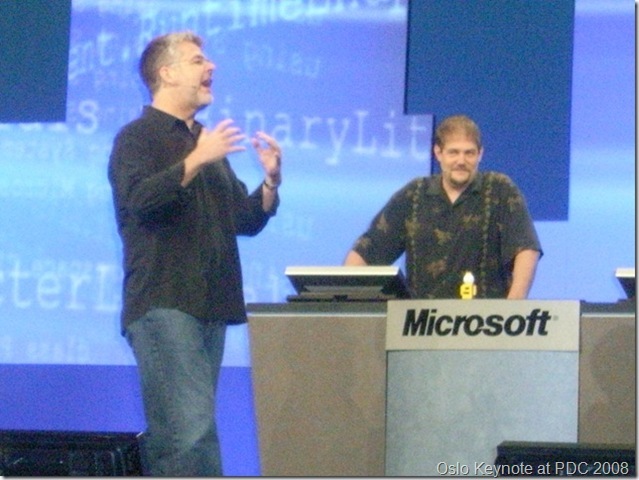 On my long drive home last night, I was thinking about the .NET Rocks episode with Ted Neward and Amanda Laucher on F# and functional programming. Though they’re writing a book on F# together, it seems even they have a hard time clearly articulating what functional programming is all about, and where it’s all headed in terms of mainstream commercial use… aside from scientific and data transformation algorithms, that is (as with the canonical logging example when people explain AOP). I think the basic error is in thinking that Functional is a Style of programming. Yet, to say that so-called Imperative-based languages are non-functional is ridiculous. Not in the sense that they “don’t work”, but that they’re based on Objects “instead of” Functions. This isn’t much different from the chicken-and-egg problem. Though the chicken-and-egg conundrum has a simple (but unobvious) answer, it doesn’t really matter whether the root of program logic is a type or a function. If I write a C# program with a Program class, the Main static function gets called. Some action is the beginning of a program, so one might argue that functions should be the root-most logical construct. However, you’d then have to deal with functions containing types as well as types containing functions, and as types can get very large (especially with deep inheritance relationships), you’d have to account for functions being huge, spanning multiple code files, and so on. There’s also the issue of types being organizational containers for functions (and other members). Just as we use namespaces to organize our types, so we use types to organize functions. This doesn’t prevent us from starting execution with a function or thinking of the program’s purpose functionally; it just means that we organize it inside a logical container that we think of as a “thing”. Does this limit us from thinking of business processes as functional units? Ted Neward suggests that we’ve been trained to look for the objects in a system, and base our whole design process on that. But this isn’t our only option for how to think about design, even in our so-called imperative languages. If we’re thinking about it wrong, we can and should change the process; we don’t need to blame our design deficiencies on the trivial fact of which programming construct is the root one. In fact, there’s no reason we should use any one design principle to the exclusion of others. Looking for the things in the system is and will remain a valuable approach for discovering and defining database schemas and object models. The very fact that “functional languages” aren’t perceived as especially useful for stateful components isn’t a fault of a style of programming, but is rather a natural consequence of functions being an incomplete aspect of a general purpose programming language. Functional is a subset of expressive capability. Where “functional languages” have demonstrated real value is not in considering functions as root-level constructs (this may ultimately be a mistake), but rather in increasing the flexibility of a language to be much more expressive when defining functions. Making functions first-class citizens that can be passed as parameters, returned as function values, and stitched together with metaprogramming techniques, is a huge step in the right direction. The use of simple constructs such as operators to match patterns, reverse the evaluation of functions and the flow of values with piping, and perform complex set- and list-based operations, all increase the expressive intensity and density of the functions in a language. This can only add to the richness of our existing object models. Sticking objects together in extensible and arbitrarily complex structures is routine for us, but now we’re seeing a trend toward the same kind of composability in functions. Of course, even this isn’t new, per se; the environmental forces that demand this power just haven’t become significant enough to require that level of power in mainstream languages, because technology evolution (like evolution in general) tends to work by adapting solutions that are “good enough”. It’s common to hear how F# is successfully incorporating “both functional and imperative” styles into one language, and this is important because what we need is not so much the transition to a functional style, as I’ve mentioned already, but a growth of greater functional expressiveness and power in existing, successful, object-oriented languages. So let our best and favorite languages grow, and add greater expressive powers to them, not only for defining functions, but also in declaring data structures, compile-time constraints and guarantees, and anything else that will help to raise the level of abstraction and therefore the productivity with which we can naturally express and fulfill our business needs. Ultimately, “functional programming” is not a revolutionary idea, but rather an evolutionary step forward. Even though it’s impact is great, there’s no need to start from scratch, to throw out our old models. Incompatibility between functional and imperative is an illusion perpetuated by an unclear understanding of their relationship and each aspect’s purpose. I use many common design patterns on a regular basis–composite, MVC/MVP, adapter, strategy, factory, chain of command, etc.–but I’ve never come across a situation where I felt Visitor in the classic definition (GoF) made sense. I had read about it, but the necessity of defining the interfaces for not only the Visitor classes (that’s not so bad) but also the elements being visited, makes it seem overly complex and therefore tainted for me. What if you don’t own the source code to the elements, and don’t want to inherit from existing types (if they’re not sealed) just to implement an IVisitedElement interface? I wanted a less intrusive way of visiting any set of objects, without making any special demands on or assumptions about their types, and I suspected that new features in C# 3.0 would provide a way to make it elegant and terse. What’s needed in essence is to visit each object in a collection with a common function or object, and to perform some action, transform the object in some way, and/or calculate some end result (usually an aggregation). Can we do that without having to implement special interfaces or disrupting the code model in place? For the sake of completeness and to serve as a baseline for other implementations, I’ll show you what the classic Visitor pattern looks like. Here is the code that corresponds to this diagram. The first major disadvantage is the amount of plumbing that must be in place, and the two-way dependencies created, between visitors and the objects to be visited. Though specific types aren’t hard-coded, a conceptual two-way dependency implied by the interfaces’ knowledge of each other requires forethought and special accomodations on both sides from the beginning. Management of dependencies is always important; how well we do so determines how applications become more complex as they grow. So whenever possible I ensure that dependencies run in one direction. This creates natural segmentation and layering, and ensures that components can be pulled apart from each other rather than congealing into something like a tangled ball of christmas tree lights. Instead of passing a collection of Employee objects to some calculating Visitor, we tell the Employee to accept a Visitor object, which then just turns around and calls the Visitor. That by itself seems rather indirect and convoluted. Visiting a single element isn’t very exciting. Nothing very interesting happens until you have a whole bunch of things to work with. So in order to visit a collection, a custom collection type is defined with an Accept method that in turn calls Accept on each Employee. This custom collection is yet another type we’re required to write when otherwise a List<Customer> or something similar would suffice. And what happens when your data structure is something other than a basic list? What if you have a tree of objects you’d like to visit? Would you then have to implement a tree data structure that is visitor friendly? How many aggregation types do you want to reinvent with visitation specifically in mind? The rest of it isn’t so bad. The SumIncomeVisitor class contains both the processing logic and state for any calculations needed by that Visitor. One of these is instantiated (another extra step), passed to the collection’s Accept method, and therefore executed against all employees in the collection. After all objects are visited, the SumIncomeVisitor object contains the final result. This all works, but seems pretty klunky. Perhaps the pattern is more interesting if IVisitorElement classes provide more sophisticated Accept implementations. I can’t think of any examples off-hand but I’ll be thinking about and looking for these. The code above is just shy of 80 lines long. Can we accomplish exactly the same goal with less code, more simply and clearly? There are no IVisitorElement or IEmployeeVisitor interfaces. Employee and Manager types exist without any knowledge of or explicit support for being visited. No custom collection is required, so a basic List<Employee> is used. In order to make this work, we need the same basic things that we needed before: visiting/processing logic, and a place to store state for that processing. In the second approach, the state is stored in the TotalIncome variable within the Main method, where the calculation is being requested, and the processing logic kept in another method of the same class. I could have declared TotalIncome as a class variable, but I’d really like to restrict any “scratch pad” data used in a calculation to have as restricted a scope as possible. In the classic Visitor pattern, the data is encapsulated with the processing logic. By calling a method with a secondary ref parameter, I can declare TotalIncome within the Main method and avoid cluttering the class definition with data that’s only relevant to one method’s logic. This is a lighter-weight, more in-line approach than defining separate types and having to instantiate a Visitor object (Visitor Object vs. Visitor Method). The actual mechanism for visiting every object is the ForEach method. The List<T> class includes a very useful ForEach method that allows you to pass in an Action<T> delegate to execute a method for each element. ForEach can’t take a method with our second ref parameter; it can only accept an Action<T> delegate. The lambda expression e => SumEmployeeIncome(e, ref TotalIncome) creates an anonymous method that does in fact match Action<T>. The parameter e is of type Employee because the employees collection is List<Employee>, which means the Employee type is inferred for Action<Employee>. The anonymous method represented by the lambda then calls SumEmployeeIncome, passing the Employee e object through as well as the TotalIncome state to be transformed on successive calls for each Employee. Finally, SumEmployeeIncome acts as the Visitor. Different logic can be performed for different types where inheritance is involved, as it is with this sample, by testing for types using the is operator. This is in contrast to the dual Visit methods taking Employee and Manager types respectively. Actually, the classic Visitor pattern could have used the same approach in this regard. Where more complex state is needed for processing, a new Visitor-state type could be created to support the processing, and by using an object for this purpose, it wouldn’t be necessary to declare or pass the parameter by reference. Another option would simply be to declare multiple ref parameters. The List.ForEach method is awfully nice, but what if you’re working with another data structure, such as an array, an ArrayList, a LinkedList<T>, or even a Tree<T>? Defining a simple extension method can provide this tool regardless of what kind of collection you’re working with. That’s better. Now if only that extension method had been defined in the first place, the specific one in the List<T> class wouldn’t be necessary. There’s an even more succinct way to accomplish the specific example above, using the Sum extension method on IEnumerable<T>. You can see that there is more opportunity here to perform other actions and participate in more complex calculations. This approach is even lighter-weight than the second approach suggested above using a separate named method and external state passed by reference. The approach you take should depend on the needs and constraints of the situation. Lighter-weight approaches are good for ad-hoc processing, whereas the heavier approaches make more sense if the visiting logic needs to be reused in other places. Extension methods “add” functionality to existing classes, or at least create a compelling illusion that they do. Just reference an assembly and import the right namespace to add the operations. It is possible to share state, but only by doing something like passing in some shared state object to each call. With the use of lambda expressions and extension methods, we’ve been able to cut the amount of code for the Visitor pattern by more than half and found that there was no need to specially prepare the data model classes to support visitation. 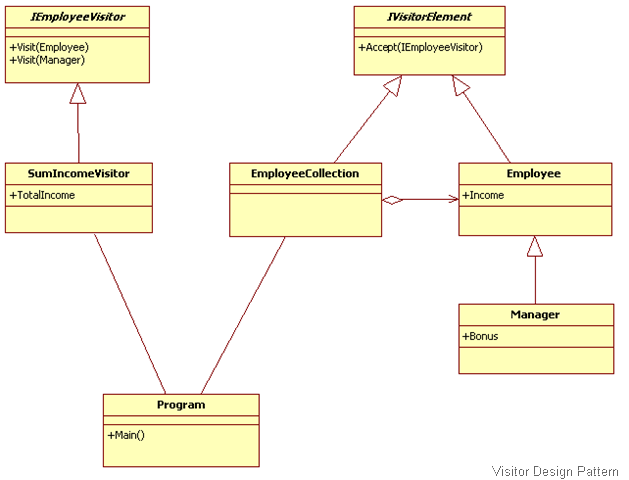 While the classic Visitor pattern may have more potential in complex and custom Accept scenarios, in general the need to visit elements of a collection can be better accomplished with the judicious use of available language features in C# than by blindly following classic design patterns without consideration for how relevant they really are. While I certainly encourage developers to become familiar with common patterns, I also encourage them to think carefully about the code they’re writing, and to ask themselves if it’s as clear and simple as it can be. As software systems grow in size–sometimes becoming victims of their own success–small inefficiencies and muddied designs can snowball into unmanageability. Apply a simple solution first, and then add complexity only when necessary. Doubt and ask why constantly. Be educated and familiar with the literature, but don’t dogmatically accept everything you read: think for yourself and hone your skills at every opportunity. While the goals and forces in software tend to remain constant over time, the forms that made sense years ago may become unnecessary with today’s tools. I’ve always thought it was odd that the .NET Framework never shipped with a Tree or Tree class in its collection namespaces. Most of the other classic data structures are there: List, Dictionary, Stack, Queue, and so on. Where then is Tree? I have no idea, but finding myself in need of one, I decided to build one, and in doing so realized that it was a little trickier than I first imagined it would be. Certainly it isn’t difficult to get some kind of tree working, even without support for generics, but building one that is truly intuitive to use was a real challenge. 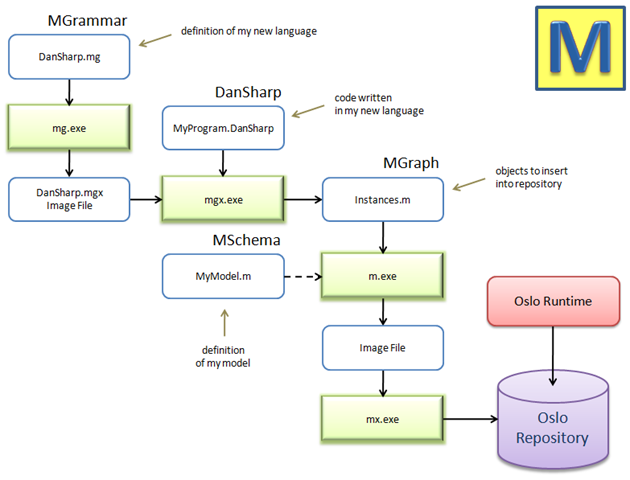 In this article I will share what I came up with, and will illustrate the thought process behind each of the design decisions that I made as a study in object-oriented design and the use of some cool C# language features like generics constraints. First, what is a tree data structure and what is it used for? A tree is, in layman’s terms, a collection of nodes (items) that are connected to each other in such a way that no cycles (circular relationships) are allowed. Examples abound in organization charts, family trees, biological taxonomies, and so forth. Trees are incredibly useful structures because they allow us to represent hierarchies and to compose complex structures out of basic parts and simple relationships. In the world of programming specifically, this provides a mechanism for extensibility across many domains, and a container to assist us in searching, sorting, compressing, and otherwise processing data in efficient and sophisticated ways. Trees are also a natural fit for use in the composite design pattern, where a group of objects can be treated (or processed) like a single object. Just as it’s possible to implement recursive algorithms non-recursively, it’s also possible to create non-hierarchical data structures to store data that would more logically be stored in a tree. In these cases, your code is typically much more clear when organized in a tree, leading to greater maintainability and refactorability. 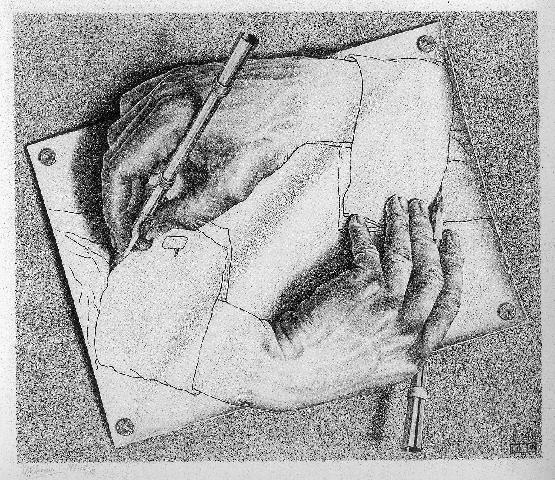 Recursion itself, while not exceptionally common in every day programming tasks, plays a more important role in some interesting ways with trees and traversal patterns. Traversal is the term used to describe how nodes in a tree are visited. Later I’ll demonstrate some tree traversal techniques that you can use. What are binary trees, and why the focus on non-binary trees? Binary trees are a special kind of tree in which each node can only have two children, often referred to as left and right child nodes. These special trees are very useful for sophisticated searching, sorting, and other algorithms. However, trees that allow any number of children seem to abound in more general, every-day programming scenarios, as you’ll see from examples below. In a follow-up article, I’ll demonstrate how you can create a BinaryTree class that inherits from Tree and applies the necessary restrictions and some useful abstractions. Below (figure 1) is a binary tree, which I present here to contrast with the non-binary trees that we’ll be covering in detail. Figure 1. A generic binary tree. For more information on implementing and using binary trees, see this article which is part of a larger series on data structures. A simple example of a non-binary tree is the file system in any modern operating system. The diagram below (figure 2) illustrates a small part of the structure of the Windows file system. Folders can be nested inside other folders as deeply as needed, providing the ability to compose a complex organizational structure for storing files. The traversal path—from the root to some other node—can be represented by a canonical resource descriptor such as C:\Windows\system32. Figure 2. The file system is a tree structure of folders containing other folders. This hierarchical structure can be represented and visualized in different ways, though the underlying relationships are the same. 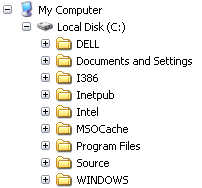 The screenshot below (figure 3) is of Windows Explorer on my development computer. The control is the common TreeView, which supplies a way in this case for users to explore and interact with the tree data structure of the file system. Figure 3. 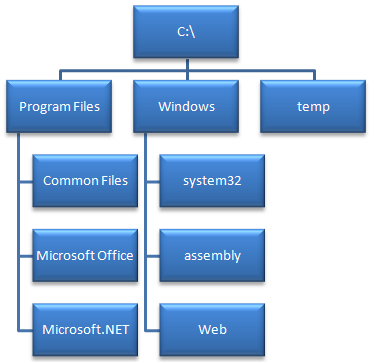 A tree view control in Windows Explorer provides access to a hierarchy of nested folders. Another example is the organization of controls in a form (for Windows Forms) or in a window (for WPF). The next diagram (figure 4) depicts the relationship of controls containing child controls, which may in turn contain their own children, and so on. Figure 4. 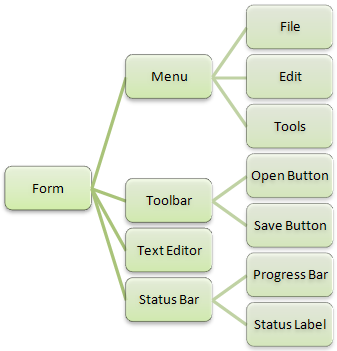 A user interface is composed of a tree of controls that contain other controls. This is also manifested through a user interface with the Document Outline window in Visual Studio, which is very useful for selecting deeply nested controls, or container controls that are otherwise difficult to select in the forms designer itself. This is shown in figure 5, where you can clearly see the different levels of all controls. Figure 5. 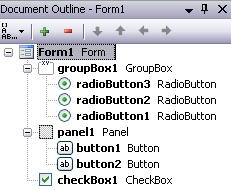 The document outline window in Visual Studio for a Windows Forms screen. There is a lot of formal terminology in graph theory to contend with, but for our purposes, we only really need to be concerned with a few basic terms. 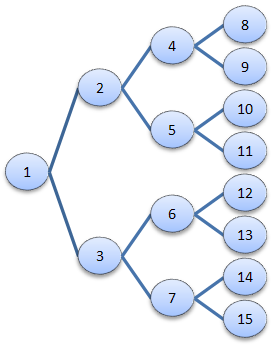 Tree – This refers to a collection of nodes connected by parent-child relationships in a hierarchical structure. Parent – A node one level up from the current node. Child – A node one level down from the current node. Node – One item in a tree with an optional parent and zero or more children. Root Node – A special node with no parent. A tree can have only one root node. Subtree – A section of a larger tree including the non-root node of a larger tree, plus all of its children. That’s not so bad, is it? In designing a reusable tree data structure, it’s important to establish a consistent and sensible pattern for semantics. In fact, coming up with good names for the components of our data structure may be the most difficult part. With poor identifiers, even simple structures can be confusing to those using it. This is much better, and leads to two more steps that we’ll need to take conceptually. The first one is that I will definitely want a tree of nodes for custom types in my software’s problem domain, perhaps Customer or MobileDevice objects. Like strings, these objects are (for our purposes here) simply dumb containers of data in the sense that they are unaware of the tree structure in which they reside. If we take this one level further, and consider custom types that are aware of their place within the tree (and can therefore particpate in much richer ways to compose hierarchical algorithms), we’ll need to consider how to make that awareness happen. I will explain this in more detail later in this article. The root node is defined as a Tree, but is manipulated like the other TreeNodes because it inherits from TreeNode. Each node’s value is stored in a property called Value, which has a type of T (using generics). A Depth property indicates how deeply in the tree the node is nested (the root has a depth of 0). The Add method in the Children TreeNode collection returns a TreeNode object, making it easier to create a new node and get a handle to it in the same statement. The ToString override is very important for making your debugging sessions more manageable. Without this kind of assistance, especially when troubleshooting recursive, hierarchical algorithms, you may go crazy digging through the debugger’s own tree view control to find what you’re looking for. The TreeNode itself gets a little tricky. If you update the Parent property because a node is going to be moved to another part of the tree, for example, you want to make sure that it gets removed from the Parent’s list of Children, and you also want to add it as a child to the new Parent. If the Parent was null, or is being set to null, then only one of those operations (remove or add) is necessary. There are two ways we could find the Root node. The commented line shows a succinct way to walk the tree (recursively) toward successive parents until Parent is null. The actual implementation being used shows another way, using a simple while loop. I prefer this because in the event of debugging, it’s easy to step through a loop, and a little more difficult to jump through the same property on multiple, perhaps many, different instances of TreeNode. I follow the same pattern for the Depth property (below). A tree structure isn’t very useful, however, unless it can carry some kind of payload. You want to build a tree of something, and it’s handy that we can use generics to tell the compiler that we want a Tree of strings (Tree), for example. That’s what the Value property is for, and why its type is the generic type parameter T.
You probably noticed in the last section that the Value object is checked to see if it implements the ITreeNodeAware interface. This is an optional extensibility mechanism for custom classes that need to be aware of the tree so that payload objects can read or manipulate it in some way. In developing a data binding framework for Windows Forms that allows you to bind control properties to paths (“PurchaseOrder.Customer.Name”) instead of specific objects (PurchaseOrder.Customer, “Name”), as ASP.NET and WPF data binding works, I needed this ability and came to the conclusion that this would be a useful feature in general. Later in the article, I will magically transform the TreeNode and TreeNodeList classes in such a way that both this interface and the Value property become unnecessary. Until then, here’s how the interface looks with an example class that uses it. Using the ITreeNodeAware interface means we have another step to make in our implementation, and adds some complexity to its use in terms of discoverability and implementation of the interface by consumers of the Tree structure in creating custom payload classes. By doing this, however, our Task objects will get injected with a Node property value when added to a Tree of Tasks. So the payload object will point to the node via the Node property, and the Node will point to payload object via its Value property. This is a lot of logic for such a simple relationship, but as we’ll see later, there is an elegant way around all of this. There are some common measurements of aspects of the tree’s nodes, as well as operations that you will typically want to perform on a tree or subtree, such as initialization, systematic traversal, pruning and grafting, disposal, and determination of depth, some of which I will discuss here. Because the payload objects (referenced by the Value property) may require disposing, the tree nodes (and therefore the tree as a whole) is IDisposable. Different trees of objects may require being disposed in different orders, so I’ve created a TreeTraversalType, a DisposeTraversal property of this type to specify the order, and have implemented the Dispose method that takes this into consideration. Here is one way to implement IDisposable that includes a property indicating whether a node has been disposed, invokes a Disposing event, and traverses the tree according to the value of DisposeTraversal. I overrode ToString in the TreeNodeList class above to display the count of children. I do the same thing for TreeNode, which as I mentioned earlier aids a great deal in debugging. Notice how the Value property, if it’s set, gets included in the ToString value. If you’re looking at a TreeNode in the watch window, you’ll appreciate that your Value object can be represented without having to drill into anything. You can see at a glance what the payload is, how deep it is in the tree, and how many child nodes it has. Note that Parent doesn’t return our object of type T, but instead gives us a TreeNode; and our CurrentTaskNode object is also a node object and not a task object. When we think about trees in theory, especially visually in the form of diagrams, the parent of a node is another node, meaning that parent and child are the same type of thing. In our simple implementation so far, however, the parent of a task is not another task, but rather a task-tree-node, which is not the same thing. Notice how each time we access Node or Value, we’re weaving in and out between types. So we must manipulate this data structure and its payload all the while with explicit deference to the type disparity and dualism, and a careful naming of variables is important to avoid confusion between types (CurrentTaskNode vs. CurrentTask). When I first had this realization, it occurred to me why a Tree data type may have been missing from the original .NET Framework. I doubt very much that all the brilliant developers working on the base class libraries didn’t think to include such a useful structure, but perhaps the obvious implementations that came to mind seemed confusing and problematic for real-world use. Fortunately, we now have capabilities in the CLR as of 2.0—and corresponding language features—that enable us to solve this problem elegantly. I’m referring to generics, and more specifically, to generic constraints. It’s been compressed! The Node property is no longer necessary (since the task is-a node, instead of being contained-by a node), and therefore the ITreeNodeAware interface can also be dispensed with. The MarkComplete method is different, too: we simply write Child.MarkComplete instead of Child.Value.MarkComplete, and we can loop through a collection of Task objects with the Children property directly, instead of going through a set of TreeNode objects in some external Node object. We could use TreeNode as well; it makes no difference. Task = Tree = TreeNode. To make all of this magic happen, we need to define TreeNode with a generics constraint. This breaks us out of a restrictive pattern where normally a custom collection class is unable to richly manipulate the objects within it (unless the collection is instantiated directly from consumer code, which is not the case in this pattern). But because the collection class knows that all of its items will derive from TreeNode, it can manipulate them as tree nodes with no problem. There is a price to pay for this convenience, however, which is that the tree is restricted to types that inherit from TreeNode. This means that a Tree is no longer possible. You will have to decide how you will likely use trees in your development to determine whether to design something like this into it. If you want this cleaner syntax but still need trees of primitive and other non-TreeNode-derived types, you can create a distinct SimpleTree for this purpose. It may even be possible for Tree to inherit from SimpleTree, hiding the Value property (with a private shadow method shown below) and adding the generic constraint. Now that the basic functionality is in place, I decided to split the Tree class into two. SimpleTree represents a simple tree data structure that can contain as its Value any object; and ComplexTree, which uses the generic constraint described above and supports more complex hierarchical algorithms and tree-aware nodes. I really like the simplicity of the Tree name, but along with the need to support both simple and complex scenarios, there are two more reasons for this name-change decision. First, in the System.Windows.Forms namespace, there is already a TreeNode class that corresponds to the TreeView control. If I had designed that control, I probably would have named it VisualTree and its node VisualTreeNode to distinguish it from a logical node, but as it is, dealing with two different TreeNode classes, even in different namespaces, could be confusing and messy. Second, the new Task Parallel Library (TPL) contains an implementation of a binary tree called Tree, which is a rather short-sighted name considering that all useful trees are not binary trees, as I’ve demonstrated in this article; BinaryTree would have been a much more appropriate name. Hopefully by the time TPL is released, this identifier will be updated to reflect this. Elegant implementations of tree data structures in .NET Framework, though problematic in the past, are finally possible with the introduction of generics and generic constraints. With some careful syntax planning for consuming code, as well as experimentation with different language constructs, I hope I have shed some light on how these kinds of problems can be approached and solved. In future articles, I will be exploring some techniques and specific uses for hierarchical algorithms. Some of the very problems that appear too difficult to solve without a background in mathmatics can be much more easily understood and mastered by using tree data structures and associated visualization techniques. I was recently asked which professional skills were most important for a software architect, and the answers I came up with, I believe, apply to professionals in general. Some of the following descriptions are slanted toward the software architect, but can be applied quite easily to other professions. Customer advocacy. First and foremost, we have an ethical obligation to our clients to discover and represent their best interests. There are unscrupulous consultants who will milk contracts for as long as they can for their own financial survival, and this is a serious problem because it creates mistrust in our industry and problems for those who are honest. As this problem may be outside of our immediate sphere of influence, I would also point out that even with the best intentions, those who are honest may not be serving the customer’s real needs due to hyperfocus on the detail and technology, and unfamiliarity with the requirements or lack of focus on business needs. Some of this can only come with experience, but I believe we can all learn what our limitations are and to admit when we aren’t seeing enough of the big picture to make a confident recommendation. This is an important focus of systems architecture organizations such as IASA and WWISA. Dan Appleman in a recent Hanselminutes podcast episode covers this responsibility of the Software Architect very well. I had the opportunity to meet Dan briefly at DevConnections, and consider him to be a great role model. Articulate and organized written and verbal communication skills. Communication skills are the glue that hold teams together and allow a single coherent vision of a project or product to be shared. The most important of these skills is listening, or observation in general, as decisions can only be as good as the information they’re based on. Communication skills can be further broken down for more intense self-examination and improvement: the ability to compose meaningful and relevant messages; delivery of those messages via writing, impromptu speaking, and prepared presentations all require different skills; and observance of social protocol to appear responsive, considerate, etc. When I hear people saying that someone has “poor communication skills”, they are most often referring to a failure to observe social protocol, not that the person isn’t capable of composing and articulating their thoughts well. Negotiation and conflict resolution. Everything that involves communication contains the potential for conflict. Knowing how to negotiate can prevent daily micro-conflcits from escalating out of control. When we understand that conflict is normal and comes from the interaction of different perspectives, requiring a dynamic, shifting dance of give and take, we can embrace and work with it, using that energy and the diverse perspectives involved to our advantage, fueling our creative processes instead of letting them degenerate into unhealthy ego battles. Problem-space modeling and creative problem solving. The effectiveness of the solutions we put in place depend primarily on the way we view the problem. Modeling a problem (seeing) is a very creative process, and the ability to be flexible and think outside the box when looking at a situation can lead to much simpler and more effective solutions. Too often, designers assume the first model they imagine “is” the problem, instead of one of many ways to view it, and build their systems with this limiting and often dangerous assumption. A willingness to play and refactor ideas, coming up with alternatives through brainstorming, and synthesizing conflicting approaches, all add to one’s repertoire of visualization techniques, and therefore problem-solving skills. Risk identification and management. Software development (as with business in general) involves a great deal of risk, with pitfalls around every corner. Incorporating new tools, processes, and team members, solving problems in unfamiliar domains, company acquisitions, etc., can make a project miss schedule and budget targets. Identifying the risks involved requires project experience and good observation skills. Managing them requires organization and a proactive, prioritized approach, as well as planning for several alternatives and mitigations. We start with awareness, then we identify, and finally we can manage and plan around them. Strategic (long-term) and tactical (short-term) project planning. Short-sighted design and development, and lack of planning, leads to systems that are incapable of growing with or adapting to changing business needs. Keeping long-term goals in mind ensures longevity and relevance. This depends, of course, upon the resources and leadership of the company you’re working for. You may be working on a project with a short lifetime, or your boss may not be persuaded to invest in strategic moves now to save time and money later. But for most projects, development costs are too great to be wasted on short-sighted expediency. In any case, long-term and short-term priorities and forces must be balanced against one another along the way. Every decision and trade-off will have consequences down the line. Continuous research on trends and technologies. Long-term strategic planning can’t be effective without knowing the future state of the industry or its many technologies. This is all about “knowing the territory” as Sun-Tzu has described in The Art of War. We must often plan the future state of our software systems to take advantage of technologies that aren’t yet available. This requires keeping ourselves in the loop and on top of our game at all times. This is difficult in a world that is expanding exponentially, and often requires that we find a niche specialization both to differentiate ourselves and to provide more focused value. Whereas a developer is concerned with doing things right and being efficient, an architect must focus on doing the right thing from a larger point of view. As Peter Drucker writes, “Efficiency is doing things right; effectiveness is doing the right things.” An architect must be effective.